John Birch tells us more on our quest to uncover the hidden history of women’s rugby. John follows up on the news story today which details the discovery of the earliest every record of a female playing rugby, the Irish-born Emily Valentine who played rugby as a girl in 1887. In 1884 Portora Royal School in Enniskillen, Co Fermanagh in Ireland was going through a difficult period. Student numbers were low and Mr Steele the aged headmaster passed on the effective running of the school to Classics master and Assistant Headteacher William Valentine, who had joined the school in 1883. Valentine had at least three children of school age including William, John (born and Emily Frances (born c1878, possibly earlier), all of whom attended the school. In 1887 as Emily's memoirs tell us, the three children began to play rugby with several friends and she joined in one game, scoring a try in the process. The school had previously had a rugby team in the 1870s, but with a loss of pupils the sport had disappeared and to begin with its reintroduction was not supported by the school, who denied them access to the main school field. However they still practiced and played intra-school matches every Saturday and matches against Enniskillen RFC are recorded in 1887. School records, and letters from Emily (later Mrs Galwey) to the school in 1951, show that she took part in the practices and intra-school games, and some records and some of her statements including how she played as a wing when they were short of a man tell us that despite her age she played in some of the external games as well. Several sources say at times that the entire three-quarter line was made up of Valentines, including Emily. William Valentine (snr) would appear to have left the school in about 1891 when a new head was appointed. Both William (jnr) and John went to Trinity College, Dublin. Emily married and, after a period in India, settled in England with her husband, Major John Galwey OBE. Her granddaughter eventually moved to Twickenham, where her husband still lives. She has eight great-grandchildren and died in 1967. 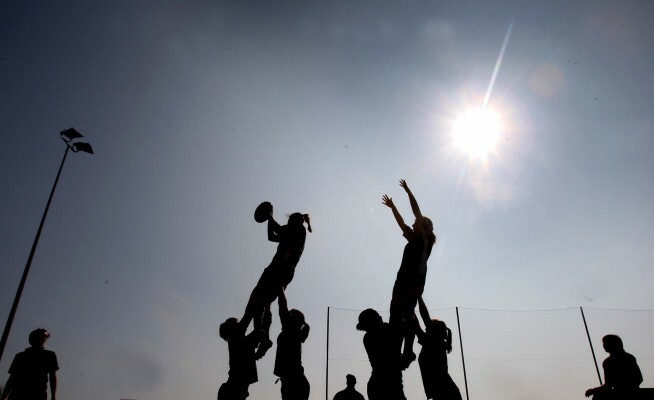 Why is this important for womens rugby? Emilys story is remarkable because there are no other records at all of any other female rugby players in the nineteenth century. Although there is some vague suggestions that the womens rugby teams may have been played in France, and possibly New Zealand, in the 1890s it is not until 1917 that we know of another female player 16 year-old Mary Eley who played for Cardiff Ladies (a team formed from women working at a local brewery) who beat Newport Ladies 6-0 at Cardiff Arms Park on 16th December 1917. Mary died in 2007 at the age of 106 - one of the sports oldest players (though, being a woman, she is unlikely to appear in any record books). After that a handful of photographs, and less than two minutes of film, shows that womens rugby was played in France, Australia and New Zealand in the 1920s and 1930s, but there are no records of who played and how popular was and these pioneering attempts ended with the War, after which there are no records of any women playing rugby until the 1960s when the game began to be played in the UK, North America and France. Womens clubs began to appear in these countries and New Zealand 1970s, and the first international was played in 1982. But it was not until 1990 over 100 years after Miss Valentine fought to get her school team started that Irelands first womens club was formed. In practice it is unlikely that Emily or Mary and her (unknown) team-mates - are unique, but it is an indication of the difficulties that womens sport suffered from, that for so long women either felt they had to play anonymously, behind closed doors or that their attempts to play were stifled or ignored. The research that produced Emilys story stems from the remarkable discovery, only three years ago, that no-one had kept a record of womens international matches. In 2007 the 25th anniversary of the first womens international passed by almost unrecognised, even by the nations taking part.. The history of womens rugby (and much of womens sport in general) is a hidden history with stories like those of Emily and Mary that have remained untold. Too many people still believe that sport is not for women and certainly not mens team sports like rugby, cricket or football. Every generation starts again, without heroes, being told that they are strange because they want to play too. Small wonder that so few girls and women play sport. The truth is, of course, very different. Womens cricket has been played for over 250 years, womens football goes back at least 100 years and, we now know, even womens rugby has a long history too. What we want to do is to uncover this proud, hidden, and forgotten story of the game! The pioneers. There must have been other Emily Valentines. Emily cannot be the only female to play rugby before 1917 (It would, perhaps, be even more remarkable if she really was the only female to play rugby before 1900). There must have been others. Rugby in Britain before the RFUW. In 1983 the Womens Rugby Football Union was formed but what was womens rugby like in Britain before that? Again we are looking for the hidden story and above all photographs of women playing rugby (or even being prevented from playing). Even tales as recently as the 1960s and 1970s would be significant finds, and anything before that pure gold.